I have Affinity photo and Affinity designer on my Mac and have just purchased Affinity photo on my iPad. On my Mac in the iCloud Drive folder I can see folders for Affinity photo and designer as you would expect but I do not have those folders on my iPad in the iCloud Drive app. Is this a known issue and is it being looked into? Yes Chris, thats correct. The folder is just not there. Have you tried to save at least one file to these folders on your Mac as i have suggested in other thread? There's a known issue regarding not being able to save to Affinity Photo folders on the iOS version (they appear greyed out), only to the root of the iCloud Drive or other folders inside however since the folders don't appear on iOS for you it may be related with the fact that you haven't saved anything there yet from your Mac, forcing it to create the folder on the Cloud (not only just on your Mac). I just want to exclude that possibility. Yes, on my Mac i have saved/exported files from Affinity photo to this folder. I have sorted the issue out now, it turned out that the issue was not with the software but infact with myself. I noticed that i was signed in to iCloud with a different email address on my iPad than on my Mac, once i signed out and then back in making sure that the email address was the same on my Mac and iPad the folders then appeared. I see that a couple of other people here are having the same issue, i can now assume that they to also have 2 or 3 email addresses associated with their apple id. One question: are you able to save to those folders on iOS or they also appear greyed out for you? Yes on iOS the Affinity photo folder is greyed out and i cannot save to it, i can import from it just not export/save to it. I have this same issue as well. I've used Affinity Photo on my Mac and have lots of files saved on the iCloud Drive folder for the app. I can import a file from there on my iPad, but I cannot save to that folder, it's grated out. 1. Is there a way to just save to Affinity Photo iCloud Drive folder by default, instead of locally? 2. 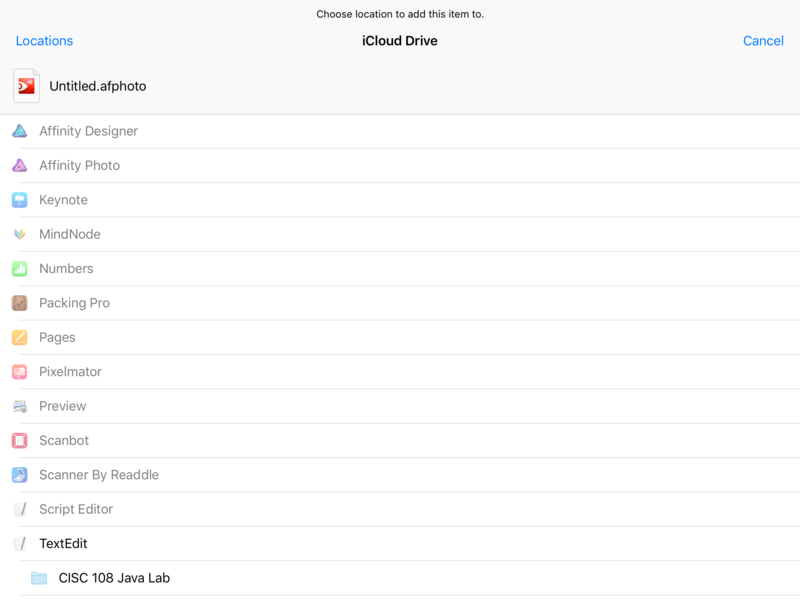 If I import a file from iCloud Drive, it then becomes local? And then I would need to save a copy again, explicitly to iCloud Drive, to have it sync with iCloud? The latest version of Affinity Photo for iPad brought a feature that you are asking for in your second question.